Christians celebrate the birth of Jesus on Christmas. 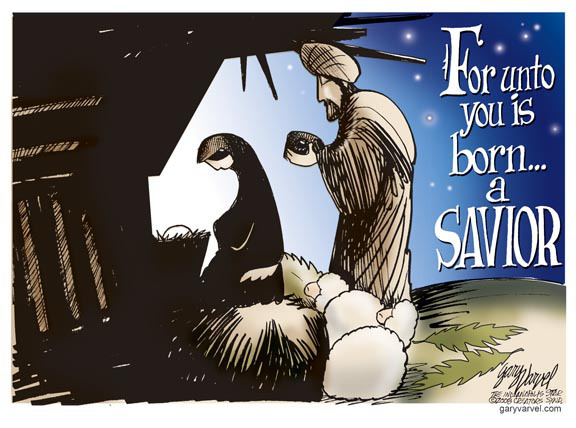 “For unto you is born a Savior” originates from the Bible, in the account of Jesus’ birth. 1. a) Who said “For unto you is born this day in the city of David a Savior who is Christ the Lord”? b) To whom was he speaking? c) What was the good news that he brought? b) The angel was speaking to shepherds. c) The good news the angel brought was that the savior of all people was born on that day in the city of David (Bethlehem). So it was, when the angels had gone away from them into heaven, that the shepherds said to one another, “Let us now go to Bethlehem and see this thing that has come to pass, which the Lord has made known to us.” And they came with haste and found Mary and Joseph, and the Babe lying in a manger. Now when they had seen Him, they made widely known the saying which was told them concerning this Child. And all those who heard it marveled at those things which were told them by the shepherds. … Then the shepherds returned, glorifying and praising God for all the things that they had heard and seen, as it was told them.